Unless you were raised in the South, sorghum isn't an ingredient you've encountered often -- if at all. A couple of generations ago, sorghum was a staple sweetener in the South. It was cheap, plentiful and often went by the name of sorghum molasses. The thick golden syrup was used in place of pricier sweeteners; and those that have grown up on it are partial -- with an almost nostalgic attachment -- to the flavor. Edward Lee, Southern chef and cookbook author said to AP that this sweetener has "a unique flavor. And it adds a lot of depth to what you're cooking, more so than honey." And Sean Brock, the James Beard Award winning chef, says in his new cookbook Heritage that the flavors of sorghum remind him of home, where every fall the community would get together to harvest the tall plant and boil down the sorghum syrup. Sorghum is a cereal grain that grows tall like corn, and it is used for a lot more than just sweetening. First and foremost, in the United States, sorghum is used as livestock feed and turned into ethanol. It's a popular crop to grow within the drier regions of the States because it is drought resistant. This quality has also made it a popular crop in Africa -- where it has been growing for 4,000 years. Actually, sorghum is thought to have been introduced to America from Africa, making its way over on slave ships. America has found yet another use for this grain: in the gluten-free market. 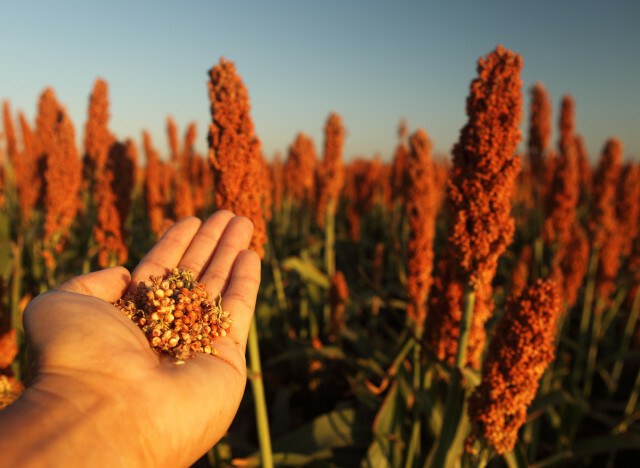 Sorghum might be popular as a syrup but it can also be used as a grain or ground into a flour -- it is in fact an ancient whole grain full of nutritional benefits. Ground into flour, sorghum can be used as a substitute for wheat flour. Though, it has no gluten (obviously) so it requires a binding agent in some recipes like xanthan gum or cornstarch. And that's not all, sorghum can also be popped like popcorn. Or cooked into a risotto. It can even be made into a lunch bowl too. How have we been surviving without this versatile grain for all these years?